Even the most skilled and steady surgeons experience minute, almost imperceptible hand tremors when performing delicate tasks. Normally, these tiny motions are inconsequential, but for doctors specializing in fine-scale surgery, such as operating inside the human eye or repairing microscopic nerve fibers, freehand tremors can pose a serious risk for patients. By harnessing a specialized optical fiber sensor, a new “smart” surgical tool can compensate for this unwanted movement by making hundreds of precise position corrections each second — fast enough to keep the surgeon’s hand on target. Researchers from the Johns Hopkins University Whiting School of Engineering and Johns Hopkins School of Medicine in Baltimore, Md., have combined the Optical Coherence Tomography (OCT) imaging technique as a distance sensor with computer-controlled piezoelectric motors to actively stabilize the tip of a surgical tool. A paper describing their new device, named SMART (Smart Micromanipulation Aided Robotic-surgical Tool), was published September 27 in the Optical Society’s (OSA) open-access journal Optics Express. “Microsurgery relies on excellent motor control to perform critical tasks,” said Cheol Song, a postdoctoral fellow in the Electrical and Computer Engineering Department at Johns Hopkins. “But certain fine micro-manipulations remain beyond the motor control of even the most skilled surgeon.” At its most steady, the human hand naturally trembles, moving on the order of 50-100 microns (about the thickness of a sheet of paper) several times each second. Various optomechatronics techniques, including robotics, have been developed to help augment stability and minimize the impact of hand tremors. 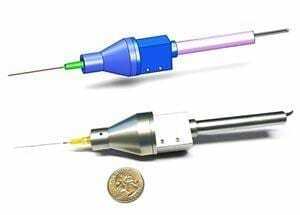 None so far has been able to seamlessly merge simple fiber-optic rapid and fine-grained sensing with handheld automated surgical tools. The major challenge for researchers has been finding a way to precisely measure and compensate for the relative motions of a surgical instrument in relation to the target. The emerging imaging technique of OCT attracted the attention of the researchers because it has higher resolution (approximately 10 microns) than either MRI or ultrasound. It also uses eye-safe near infrared light to image tissues. To apply this imaging technique to their work, the research team first had to integrate an OCT-based high-speed high-precision distance sensor directly into a small, handheld surgical device. The device could then hold a variety of surgical instruments at the tip, such as a scalpel or forceps. The well-known fiber-optic based common path optical coherence tomography (CP-OCT) technique provided the essential capability. As its name suggests, the optical signal of this sensor uses the same path, or optical fiber, to both transmit and receive the near infrared light. Because this single fiber-optic cable is so small and flexible, the researchers could easily integrate it into the front of a tool used for eye surgery. By continually sending and receiving the near infrared laser beams, the high-speed fiber-optic sensor precisely measures the motion of the probe. This information then feeds to a computer that sends signals to small piezoelectric motors integrated into the surgical device to control the position of the tool tip. This creates a series of “station keeping” maneuvers that compensate for the surgeon’s hand tremors.